So often we find ourselves storing their children heirlooms and other possessions. Many times no one wants these but there is still a sense that you are responsible for holding on to them. When is it ok to let them go and what else can these mementos be used for? Make a digital memory book. Simply having a visualization of an item may invoke a particular memory. Without having to keep items that may clutter and take up unnecessary room in your home you can take pictures of items that you would like to have a memory of. Digital storage of photographs is much more space saving and is easy to share with others. Upcycle. 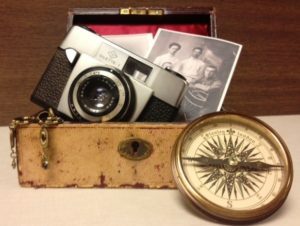 There are so many ways to upcycle a loved ones items for the preservation of memories. A button up shirt can be made into an apron, a pillow or even a quilt and given to family members. You may also find that you can upcycle and transform pieces of furniture into something better suited for your own home if you decide to keep an item. Sort out the extras. Once you decide which items that you would like to keep, go through the rest and decide if they are valuable or useful and may benefit others. Donate the things that you think could benefit others, and sell the valuable items for some pocket-money. I’ve heard of taking photos of keepsakes to save space, but I love that you take it a step further by suggesting a digital memory book. Most of us have so many digital photos that random photos just won’t have the same impact as a nicely assembled collection. I think keeping a photo of the thing, rather than the thing itself, is the best idea….as long as the photo doesn’t get absorbed into a virtual clutter pile of disorganized digital photos! A digital (or paper) memory book is a great idea. These are great tips for clearing sentimental clutter. I especially like the suggestion to make a digital memory book. It is a good way to keep the memory, clear the clutter and save space.